The subject of this review is a product called Viviscal Hair Growth Programme. Viviscal Hair Growth Programme claims to be an effective solution to the hair loss problem more of less everyone becomes familiar with at some point in their life, and wants resolved as quickly as possible. A pretty self-explanatory condition, hair loss can be the result of a number of issues and causes, however Viviscal Hair Growth Programme is an effective method to restore your hair regardless of what caused the issue in the first place. To find out more about Viviscal Hair Growth Programme, read through our review. The formula of Viviscal Hair Growth Programme has been uniquely formulated with the correspondence of lead scientists, and is currently the only hair loss supplement on the market that contains AminoMar C, which is among the most effective known ingredients for promoting hair growth. The forumla of Viviscal Maximum Strength contains a high amount of biotin, which is one of the most common substances used to strengthen hair and promote its growth. The reason for biotin’s popularity is quite simple – it’s effective. Whatever the underlying cause may be, the immediate cause of hair loss is an imbalance in the length of the various stages of hair-growth. If the length of the Anagen stage of the hair growth cycle decreases, the individual hair strands get significantly weaker and thinner, which results in them falling out. If you supplement your diet with the nutrients found in Viviscal Maximum Strength, then you can restore balance to the hair growth cycle. Viviscal Man seems to be lacking in some of the ingredients found in Viviscal Maximum Strength. Naturally, some ingredients focus on improving the qualities of hair that are considered to be attractive in women, and not in men, however the lack of certain ingredients is still puzzling. Take note that if you are allergic to fish or shellfish, you should avoid both products. 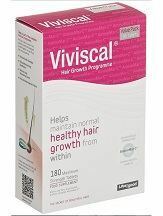 The recommended dosage of Viviscal Hair Growth Programme is two tablets per day. You should take one tablet in the morning and another at night, both times after a meal and with sufficient water. The manufacturer suggests to use Viviscal Hair Growth Programme in addition to other Viviscal products. Viviscal Maximum Strength costs $89.95 per package, which is enough for one month. Purchasing additional bottles will decrease the individual price. Purchasing a 6 month supply, for example, costs $398, saving $141.70. Viviscal Man has an identical pricing scheme, despite the significantly weaker formula. The product description suggests use for 3-6 months, however we should be seeing visible improvement within one month. After 3 months of use, I only noticed minimal improvement. While there was visibly more hair present on my head, the only reason I noticed it is because I checked how my hair looks every day for three months. The improvement is nowhere near what the manufacturer claims. The manufacturer’s website has no information about possible side effects, which is troubling. We’ve touched on the issue of allergies previously, however in some cases the use of this product may actually lead to increased hair loss. If this is the case, discontinue use and contact a doctor. There is a 6 month money back guarantee on both products, which is reassuring, however, in my personal experience, you’ll be using that guarantee. All of the customer reviews on the manufacturer’s website are positive. Viviscal Hair Growth Programme is an effective product with positive reviews and a reassuring guarantee. However, in my personal experience, those positive reviews ring hollow, as the pricing in the case of the Viviscal Man product is unfair, and the product’s formula isn’t quite as effective as the competition. We suggest looking for a more effective product.